SEACAMP II is a 7 day, 6 night program for students that have already attended SEACAMP San Diego, either during the summer as part of SEACAMP I or during the school year as part of a 5-day program. Many students choose to attend SEACAMP I & II consecutively. All of our SEACAMP II sessions have a SEACAMP I prior to them. Some students that have attended SEACAMP I in a previous year choose to attend SEACAMP II & III consecutively. Our Summer Camp is designed as a progressive program – first attending SEACAMP I, then SEACAMP II and SEACAMP III – as all labs and field activities build on what was learned and accomplished in the previous session. 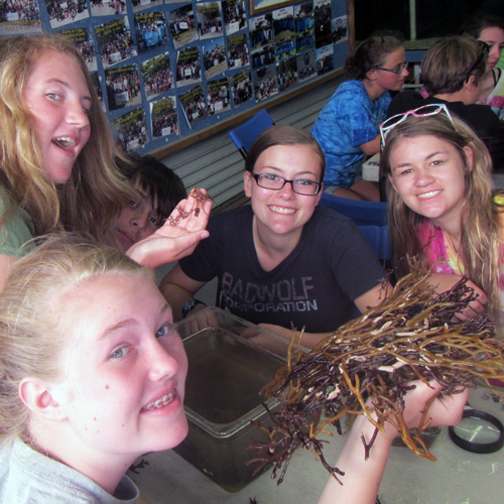 SEACAMP II will provide students a more challenging and self-guided exposure to marine science. During SEACAMP II students will have the opportunity to snorkel from a variety of sites off the shores of San Diego. Additionally, qualified students will be able to add SCUBA diving to their program. 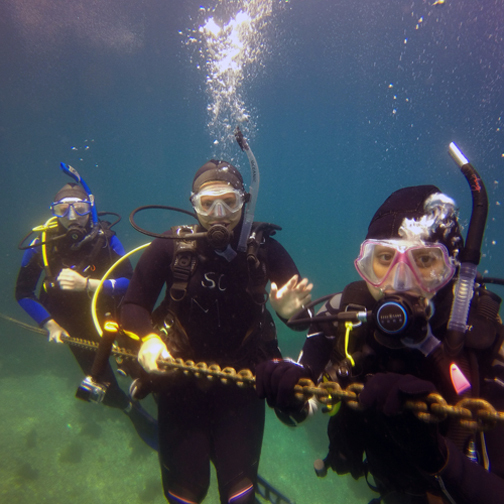 Our optional SCUBA Program is open to Certified SCUBA Divers and 14 years or older. During our unique two-day live-aboard boat trip students and SEACAMP staff will travel to the South Channel Islands for two days of snorkeling, diving, kayaking and stand-up paddle boarding. Session is Open for Enrollment. Overnight camp open to students entering 8th through 12th grade in upcoming fall with previous SEACAMP experience. *This session may be done consecutively with SEACAMP III. Students stay with SEACAMP from the start of SEACAMP II to the end of SEACAMP III. Session is full, please contact us to add your student to the wait list. Overnight camp open to students entering 8th through 12th grade in upcoming fall with previous SEACAMP experience. To make Final Payment click on button below. Enrollment is accepted on a first come, first served basis and is open until the start of the session date, providing space is available. A partially refundable $300.00 deposit is required to secure student’s spot in desired session. Students 8th grade or older have the option to attend SEACAMP I & II consecutively. Students 9th grade or older have the option to attend SEACAMP II & III consecutively. Sessions indicated with (*) may be done with the next level. Students will stay with SEACAMP from the start of the first session to the end of the next session. $1695.00 per student – $300.00 deposit required with enrollment. Tuition balance and required paperwork for selected session date are due on or before May 15th. Students will also have the opportunity to participate in a two-day live-aboard boat trip to the South Channel Islands. During the trip students and staff will be housed on the Horizon Charters’ live-aboard dive boat, one of the largest dive boats in Southern California, which is comfortably equipped for many days at sea. See more information on Horizon’s vessel here. SEACAMP II is a water-intensive week that builds on the curriculum of SEACAMP I. Students are given additional opportunities to boogie board, kayak and snorkel from a variety of sites. These activities help to prepare them for the highlight of SEACAMP II – the boat trip. Students and staff members will board the Horizon Charters boat “The Horizon” for a two-day liveaboard experience. The Horizon is a 80 foot Coast Guard inspected boat that is comfortably equipped for many days at sea. The boat cruises through the night and in the morning students awake to find themselves at the Channel Islands. Students spend two days snorkeling, diving, kayaking and other water activities before returning to San Diego. Students who are 14 years or older and are SCUBA certified will have the opportunity to participate in the optional SCUBA program. Students will participate in advanced labs and workshops during SEACAMP II. They will delve into the Advanced Invertebrate Lab by probing for living animals among kelp holdfasts in and among mussel beds. The Advanced Fish Lab provides more detailed information and builds on the basics learned in Fish Adaptations. They will learn to use field guides and keys while working with the on-site aquariums. During the week, students will develop and complete an Independent Research Project that entails a literature search, field observation and the collection of specimens. SEACAMP II also takes advantage of the attractions that San Diego has to offer. Students visit the Stephen Birch Aquarium museum and the San Diego Zoo. Students will have the rare opportunity to tour the Scripps Institute of Oceanography research pier, which is not usually accessible to the general public. While visiting some of these world-class facilities, students will have the chance to participate in scavenger hunts and to work on their individual research projects using these terrific local resources. While in San Diego, lunches are generally “bag” style and eaten in the field. Dinners are generally served “cafeteria” style at camp prior to the evening activity. Meals on the boat trip are eaten on the boat.